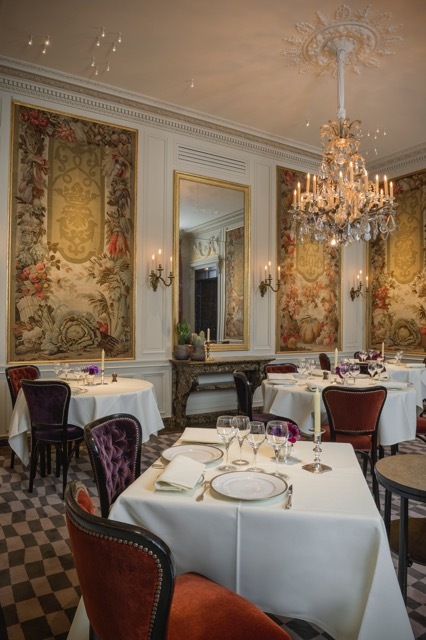 Parisian mainstay of French haute cuisine, L'Ambroisie restaurant - three stars in Guide Michelin - lies in the heart of the Marais, Paris historical district, at 9 Place des Vosges. 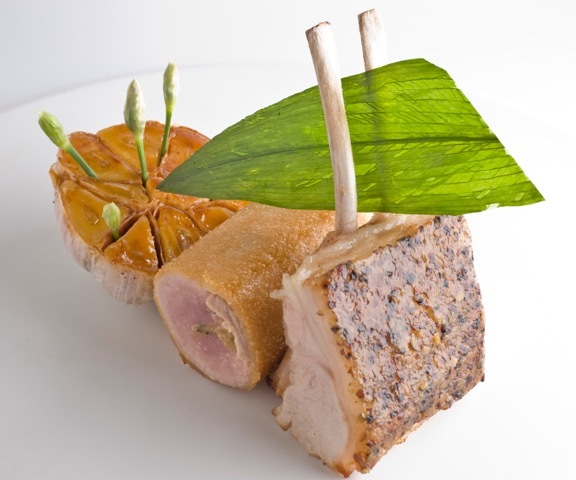 The cuisine of Bernard Pacaud is a must : classical, sophisticated and seasonal, composing "an ode to exceptional products". Tell us the origin of the project? The training of Chef Bernard Pacaud and the beginning together: how did it take place? Bernard Pacaud, trained by Eugénie Brazier in LYON, famous three stars restaurant : "la mère Brazier" (when only 7 three stars restaurants could be found in France at that time), evolved very quickly through two other restaurants, then as Chef of the Vivarois (also Michelin starred) where we met while I was a manager intern. I wanted to support him in his project to create his own restaurant and this is how the first l’Ambroisie (I found the name) was created. How was it that you thought of opening the restaurant l’Ambroisie PLACE DES VOSGES as it already existed for five years (from 1981 to 1986) at another address: quai des Tournelles ? Michelin starred after 10 months , ( 2 stars a year after) we had to find a larger place. We had a friend who was a decorator and who told us about this address Place des Vosges. We hesitated for a short while but we went for a visit and fell in love at first sight ! A real Coup de Coeur !we knew we had found the place ! What did the Place des Vosges look like at that time ? Was the decoration of the restaurant entirely created? What are your emblematic dishes ? Customers come for classic dishes that are light and a la carte all year round, such as bass with caviar, light chocolate pie, scampi puff pastry, or truffle puff pastry, the menu evolving with the seasons! Are you tasting the chef creations ? The service stands out for excellence like the carte menu, how do you recruit the best ones? One for fifteen years: loyalty is fundamental for a team! Are the recipes written, referenced? What underlies the motivation, the passion of Bernard Pacaud? Sincerity, honesty, good craftsmanship: being intransigent about sourcing ,products, quality, regularity, there is also some pleasure in this daily requirement! He is said to be an extraordinary team leader: how do you relax when you have to deal with this level of excellence ? One must work about his character , but yes he rarely gets angry! He is rather of equal temper! It is perhaps his passion for the martial arts (black belt of karate) that gives him that inner strength! Or the joys of pétanque to escape the stress! How is his perfectionism expressed? To live together our common passion, in order: the path chosen by our children, the success of my husband, the restaurant! Tell us about your experience in Corsica last summer, you who are native of the Island of beauty? Mathieu has achieved an incredible first experience in an amazing resort : he has created an innovative menu melting local products with his contemporary vision at the Domaine of Murtoli in Sartène, which has been so successful that it will be remade each summer ! The American Presidents having dinner at l’ Ambroisie, a new diplomatic tradition? The neighborhood had been looped with maximum protection, the CIA had even invested the kitchens by posting tasters! Tell us about the MACAO opening? How is your clientele evolving ? At the beginning we had 95% of French! Then more and more foreigners who have become regular customers who go down to the palaces or who live in Paris, then VIPs like the actor James Spader (Black List) who quotes the Ambrosia in a film replica: lunch in L 'Ambroisie, the best restaurant in the world, or LOUIS MALLE who demands to be invited to the Ambroisie as a reward for his participation in a jury! When you are off how do you relax? I love cinema and reading! Do you live in the Marais? Yes I am lucky enough to live in the most beautiful district of Paris! In the notion of heritage of monuments or gastronomy I like the idea of ​​continuity and transmission! Do you feel your entrepreneurial experience as a French success story like a luxury brand : GABRIELLE CHANEL for example? Yes, exactly as Chanel was wearing her creations, it is the perspective of sincerity and the quest for perfection, through our couple history, then the history of our family, it is really "lived" in our genes! Do you have an address to recommend to our readers? A walk PLACE DES VOSGES, passing by the HOTEL DE SULLY and its bookshop, then the Picasso Museum within the Hotel Salé and the Carnavalet Museum of course! And for shopping : the beautiful addresses like Guerlain or Chanel that have settled in the Marais recently! Le Marais attracts always and again!